Some overuse musculoskeletal injuries can be resistant to standard therapies. Alternative therapies may be considered earlier in the continuum of care and before surgical options are pursued. Published in Performance Retailer. Runners as a group tend to be fairly cerebral about their sport. They subscribe to running magazines and online forums, they research workout routines and nutrition plans through books and websites and they pick the brains of coaches and other runners. Despite all those resources however, runners have never been more confused about shoes than they are right now. Published in Running Insight. Plantar fasciitis is what I often refer to as a nuisance injury.It’s rarely painful enough to stop someone in their tracks but it can just keep hanging on and gradually worsening over time until it becomes debilitating. Published in New York Runner Magazine. I’m a Runner: Six steps to make running your lifestyle. Transform yourself from someone who runs into a runner by following these simple steps so you stride toward your new goal. Published in Running Insight. The running form debate has two sides; there are those who are perfectly content and comfortable running with no thought on form and on the other are those who believe that better running form can decrease the risk of injury and improve running performance. Published in Runner’s World Magazine. Surface Tension: How to prevent blisters, chafing, black toenails, and other war wounds of running. Published in Dr. Langer’s Professional Blog. By far, running shoes create more confusion than any other type of footwear. Learn about the the most common myths when it comes to finding the perfect running shoe. Published in Performance Sports Retailer. When you look back at the birth of the modern running shoes in the late 1960’s, there was no mention of cushioning, stability or motion control. It makes you wonder how the first running boom happened at all. Published in the Star Tribune. A growing subset of runners are shedding their shoes and putting bare feet to the ground — and footwear companies are starting to take note. Published in Performance Sports Retailer. Women are the driving force behind the growth of endurance running over the last few years so it is important that we understand some of the differences between men and women when it comes to footwear. Healthy feet provide the foundation for healthy aging. Without pain-free, well cared for feet, our ability to feel young and stay active is significantly compromised. Aging gracefully is vitally dependent on our ability to walk, exercise and maintain our daily activities free of the pain caused by many common foot conditions. Great Feet for Life is the first book that is written exclusively to address the most common foot conditions encountered as we age. Written by a podiatrist, it describes the changes that occur to our feet with age and addresses the most common sources of foot pain such as nail and skin changes, toe conditions, and heel pain. Detailed, illustrated step-by-step instructions are given for self care of skin and nails and a thorough discussion of footwear provides invaluable information on selecting the right shoes to prevent foot pain. Simple solutions for many causes of foot pain are presented and some commonly held myths are dispelled. 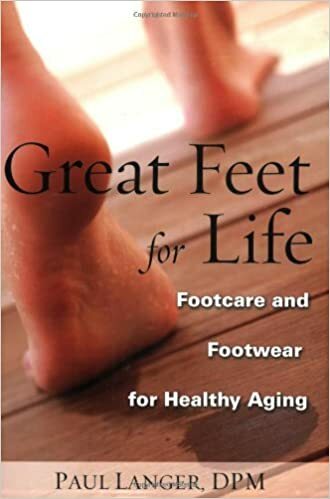 This book is written to serve as the most complete source for footcare for healthy aging. “If you’re looking for the best book on foot care, take a stroll through Great Feet For Life. Dr. Langer’s book is unique—uniquely informative and uniquely practical. Just the chapter on footwear is worth the price of admission: I’ve never encountered a more thorough and helpful treatment of this topic. Highly recommended!” Bill Gottlieb, best-selling author of Alternative Cures (Ballantine, 2008).